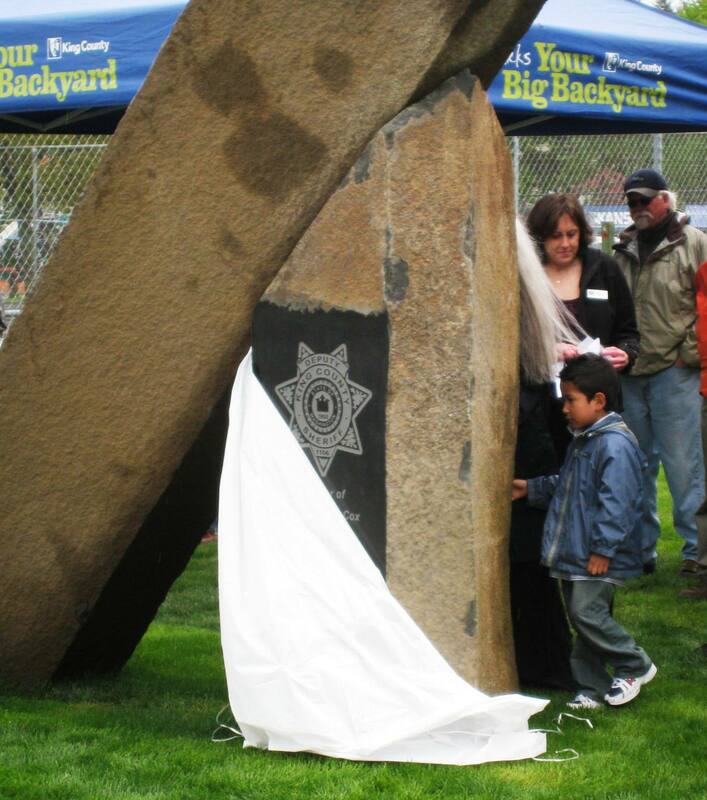 Last Sunday, May 15th, some 50 people braved the rainy and chilly weather to unveil a memorial artwork honoring the fallen King County Sheriff’s Deputy, Officer Steve Cox, who was killed in the line of duty in 2006. Officer Cox was a community leader in White Center, who could often be found in the park helping kids in the community and whose ties to the park go back to his own youth. Created by local artist Jay Haavik, the artwork – installed in the park that now bears Officer Cox’s name, Steve Cox Memorial Park – is made from a series of polished stones that feature Officer’s badge, his story, and several sayings that represent his inspirational outlook on life. The leaning stone represents the community, leading on the strength of Officer Cox, represented by the stone that features his badge. We’d like to thank all the people who helped make this project a reality – this is a beautiful addition to the park and fitting tribute to a beloved community leader. Big thanks go to the North Highline Unincorporated Area Council, who spearheaded the project with the support of 4Culture, as well as the many financial contributions from members of the White Center community. In addition to artist Jay Haavik, we’d also like to thank Marenakos Rock Center and Jan Neilsen, whose roots go back to White Center, for their determination, support, and technical expertise. Other folks who helped make this project possible include Vashon Sand and Gravel, Pacific Landscape Management, and Sawdust Supply.